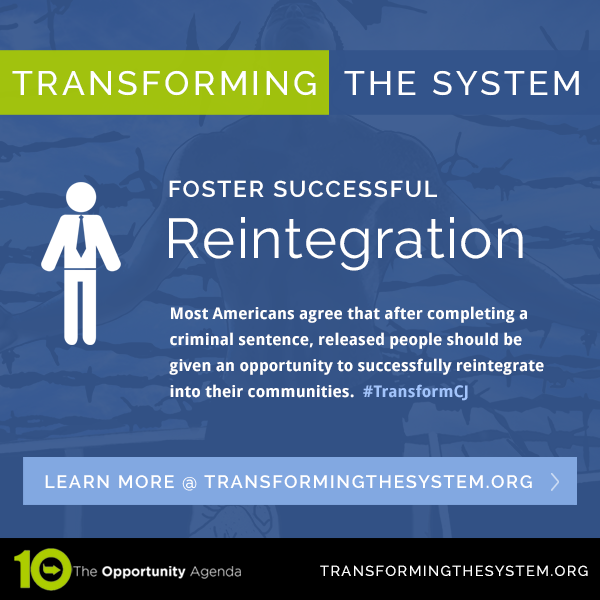 Most Americans agree that after completing a criminal sentence, people should be given an opportunity to successfully reintegrate into their communities. Everyone is entitled to a second chance to become a productive member of society. However, recently released individuals face a series of obstacles to successful reintegration. Several states have instituted barriers to re-entry including bans on voting, restrictions on accessing social services, and employment limitations. These restrictions have devastating effects on previously incarcerated individuals and make reentry extremely challenging. During each of the last several years, roughly 700,000 people have left prison; between 11 and 13 million have cycled through local jails. At both the state and federal levels, curbing recidivism and eliminating barriers to successful, sustained re-entry have become priorities driven by a mixture of concerns about the fiscal costs of incarceration and the humanitarian toll that economic and civic hurdles place on families and communities. Congress and state governments should encourage the collaboration of probate, family, and criminal courts prior to an individual's release by establishing an office tasked with maintaining family affairs, requiring that incarcerated people are sentenced to prisons near their support networks, and funding legal and counseling services to facilitate family unification. Congress and state governments should prohibit parole and probation policies that automatically prevent formerly incarcerated people from visiting prisons and jails. Congress, and local and state governments should pass legislation that requires the inspection of halfway house living conditions by qualified specialists; funds community-based halfway houses and treatment over privatized entities; and prioritizes the hiring of formerly incarcerated individuals to staff halfway houses. State, local and federal governments should repeal post-conviction consequences that hamper successful re-entry, including barriers to voting, employment, housing, serving on juries, and social services and prohibit the use of criminal background checks that are not specifically-related to the job for employment purposes. State, local and federal governments should institute graduated re-entry and vocational programs, which provide structured transitional services to individuals within a year of release, such as the Montgomery Pre-Release Center in Montgomery, Alabama, that focuses on securing a job prior to release. Legislatures should establish and fund incarceration and post-incarceration programs specifically devoted to educating incarcerated and previously incarcerated people. These education programs should include vocational programs intended to provide job skills. Congress should change the definition of “homeless” to incorporate people who have been incarcerated for more than 90 days for the purpose of expanding housing options available to formerly incarcerated individuals. State, local and federal governments should adopt policies that expand the Second Chance Act of 2007, which intends to promote successful reintegration following incarceration, by expanding the release of elderly incarcerated individuals, expanding mentoring programs and jobs programming, and providing additional skills training. State, local and federal governments should require that re-entry programs are competent in providing support to LGBTQ individuals. Congress and state governments should expand the availability of record sealing, expungement, and vacatur for individuals with criminal records. 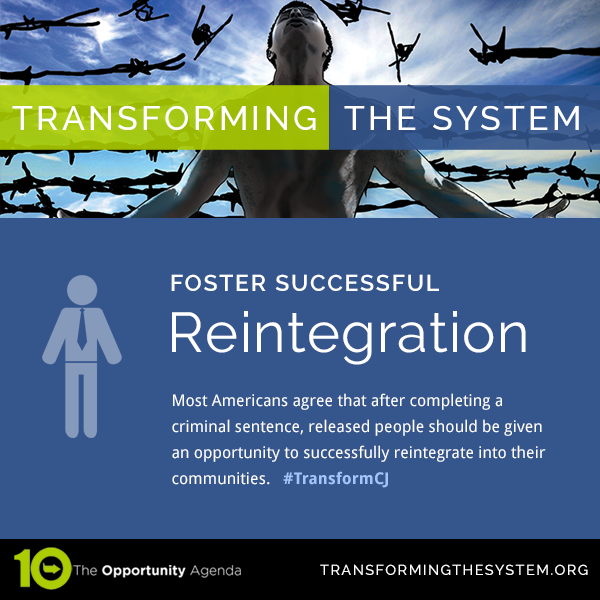 Most Americans agree that after completing a criminal sentence, people should have an opportunity to successfully rejoin their communities. The notion of second chances is crucial to a successful criminal justice system that uses a responsible and pragmatic approach over a purely punitive attitude. However, people coming out of prison tend to face a series of obstacles to successfully rejoining communities. Several states restrict people’s access to social services, make it difficult to get a job, and ban people from voting. These restrictions have devastating effects on previously incarcerated individuals and make re-entry extremely challenging and can increase the likelihood that he or she will return to prison, at avoidable human and monetary cost. Our policies should focus on how to help people stay out of prison, not somehow encourage their return. We need policies that help people rejoin their communities, settle in, and find employment. Making life more difficult for people coming out of prison only serves to further punish people and reduce their community involvement. Everyone should be granted the privileges of full citizenship, and formerly incarcerated individuals should be provided with the tools to not only reintegrate into their communities but build their communities up. Urge your Legislature to remove any existing employment, social service or voting bans, and to establish and fund incarceration and post-incarceration programs specifically devoted to educating incarcerated and previously incarcerated individuals. Just Leadership USA, which empowers people most affected by mass incarceration to drive policy reform, where our current and past Communications Institute Fellows Ronald Simpson-Bey, Khalil Cumberbatch, and Glenn Martin work on policies to empower the formerly incarcerated. National Council for Incarcerated and Formerly Incarcerated Women and Girls (NCIFWG), an organization devoted to engaging incarcerated and formerly incarcerated women and girls in policy reform. National Employment Law Project fights to ensure that people who have been involved in the criminal justice system have a fair chance at employment.